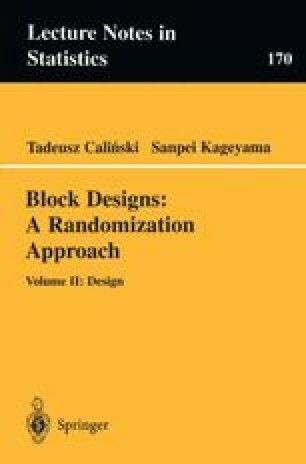 The purpose of this chapter is to present methods of constructing connected block designs that provide the unit efficiency factor for some contrasts of treatment parameters. In the terminology introduced in Chapter 4 (Section 4.4) and recalled at the beginning of Chapter 6, this means that various cases of (p0;p1,…,Pm-1; 0)-EB designs, with m = 1,2,3 and more, for which p0 ≥ 1, will be of interest. The chapter begins with a general consideration on such designs (Section 7.1), by recalling relevant results discussed in Volume I and providing several corresponding optimality results. Next, a large number of methods of construction are given for designs separated into four classes, those covering designs that are (i) proper and equireplicate, (ii) proper and nonequireplicate, (iii) nonproper and equireplicate and (iv) nonproper and nonequireplicate, first for m = 1 (Section 7.2), then for m = 2 (Section 7.3), then for m = 3 (Section 7.4), and finally for m ≥ 3 (Section 7.5).